The automotive industry has changed dramatically in recent years. Service technicians have replaced mechanics. Today's automobiles have become sophisticated systems with electronic components and embedded microprocessors. Mechanical components are being replaced with computers and circuit boards. Because of the changing industry standards, the need for qualified technicians is growing rapidly. Graduates are being recruited for entry-level positions with starting annual salaries in the $30,000 range. They go to work for dealerships, independent auto shops, and some start their own auto maintenance and repair businesses. CCCC has well-equipped, spacious auto shops that support its automotive programs in Chatham and Lee Counties. Computerized diagnostic equipment, as well as technically advanced service equipment, prepares students with real world shop experiences. 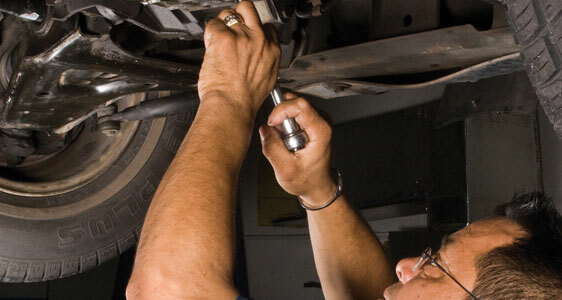 The shops are capable of handling all service and repair problems from bumper to bumper. An Associate in Applied Science Degree is offered along with a Diploma as a day program at the Lee Main Campus in Sanford. A Certificate program is offered as a part of the evening college at the Lee Main Campus, as well as the Chatham Main Campus in Pittsboro. Students take classes in engine fundamentals, brake and electrical systems, and emission controls. They study chassis electronics, suspension and steering systems, and automotive heating and air conditioning. Advanced studies in the two-year degree program include classes in engine performance and repair, transmissions, and engine electrical management. Besides an emphasis on hands-on instruction, the educational program is further enhanced by a variety of field trips to automotive parts manufacturers, automotive shows, and NASCAR racing shops. The university transfer classes are offered during the day and evening at campuses in Lillington, Pittsboro, and Sanford. Many classes are also available via distance education delivery systems including video, CD or DVD, and online formats. The Associate in Arts degree is offered in its entirety via distance education. Write technical reports explaining customers' complaints, specific component malfunctions, and related problems to include repair procedures, specifications, and parts and costs associated with each repair. Students will use standard automotive terminology and clear language to communicate in writing with customers, co-workers and supervisors. Students will complete an accurate repair order using standard automotive terminology.